Commute.org provides an emergency ride home for employees who commute by carpool, vanpool, mass transit, bicycle, walk, or other alternative commute mode. Pre-register with your employer to receive a free emergency ride home voucher. See your employer representative to register your commute activities. For more Commute.org information, click here. * Requires employer registration with Commute.org. See your Human Resource Department for more ERH information. Free Cab Ride or Rental Car! 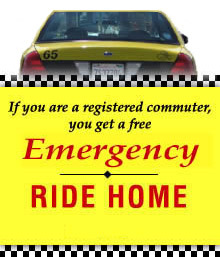 If you are a commuter who used transit, vanpool, carpool, walk, or bicycle, you may be supported by the free emergency ride home program. Ask your office manager for more information.